Monica Shaw reveals the recipe for her 'Bump Start' Prosecco cocktail – and the story behind it! Made with elderflower cordial, gin, lemon and lime, this is ideal to have during a late summer evening. If you made elderflower cordial this season, then this is what you need to make with it. (And if you didn’t make elderflower cordial, bookmark the recipe for next year and buy store-bought in the meantime). But this isn’t just about the elderflower. 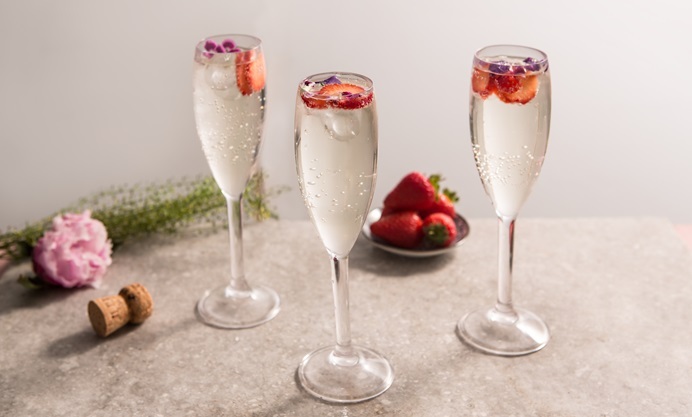 This Prosecco cocktail recipe has a story, and it’s all in the name: “The Bump Start”. It started in the Lake District. Two of my dear friends and I were on a camping trip to celebrate the summer solstice. We had few fixed plans, only to walk, talk, cook, eat and enjoy ourselves. Of course, there are some GREAT pubs in the Lake District worth getting distracted by, including The Manor Arms in wee Broughton, in the corner of their tiny square. This pub is all about the pints (no food, no music - a proper pub!). We happened there because we were in town to buy groceries (at the charming Melville Tyson grocer). We also needed cash, and learned that the only way to get cash was to go to a pub, buy something, and get cash back. A welcome interruption to our high-octane day! Sure enough the engine was totally dead. But hey, no big deal, I’ve got AA and we were in a pleasant enough place to be stuck in for a while. Plus there were loads of people around, surely someone would have jump cables? A bump start? I’d heard of this and seen it in movies - Little Miss Sunshine namely. But I had no idea how the mechanics of it worked and found it hugely intimidating (particularly since I’d parked in a parallel spot on an incline). This guy was amazing. First, through a lot of convoluted pushing, he helped us shimmy the car out of the parking spot. Then he explained the bump start, which isn’t complicated at all: basically you push the car with the clutch in, and when it’s at about 5-10mph, you release the clutch, the car “bumps”, and the engine rotates and fires. Then you quickly break and put the clutch back in and give it a few good revs. Done. Because I was parked on an incline, we were going to have to do this going backwards. As sat in the car while he and my friends did the pushing. Facing me, he was able to guide me through the whole process. He could obviously tell I was nervous and had such patience in explaining how it would all work - I swear he must be a teacher. And when it was done and the car was actually running, my heart was beating like crazy and I felt like a minor miracle had occurred - the thrill of mechanics! Hugs were shared amongst my friends and our Lake District heroes, whose names I never got, but whose generosity and kindness will never be forgotten. Furthermore, the metaphor of the “bump start” has become an ongoing thread in all aspects of life. Such a life changer deserves a tribute cocktail. This cocktail is a riff on a mocktail I make with elderflower cordial, lots of lemon and lime, and fizzy water. I’d been drinking this refreshing elixer in the early evening to “bump start” me out of an afternoon lull. I’d long wanted to turn it into a proper cocktail, and having experimented with several different types of liquor, I finally settled on gin and Prosecco as the happy combination. It contains the juice of half a lemon and half a lime, so it’s quite tart, but the elderflower balances things out. You could hold back the gin for a slightly less potent cocktail, but with good gin (Hendricks is my preferred), it actually makes the drink better. This drink tastes best after having achieved a real-life bump start of your own (but don’t drink it until you’re finished driving!). Thanks to my friend Donovan who helped me fine tune this.